Maybe it's just me, but I had the darnedest time trying to remember what seed scarification and seed stratification meant, and which seeds needed which treatment before planting them, when I first started gardening. Seed scarification and seed stratification were the seed starting equivalent of its and it's. You may see its and it's misused here on this garden blog from time to time. Fortunately for my garden I've pretty much mastered scarification and stratification. Seed scarification was really easy to remember once I remembered that what you're doing scarring seeds. A seed's hard outer coat makes it impervious to gases and moisture that would cause them to germinate. To overcome this you need to scratch, break or nick the seed coat. In nature this naturally occurs when seeds pass through the digestive tract of some animals, through freezing temperatures or microbial activities that break down the seed coat. Seeds that need to be scarified before sowing are usually large or have thick seed coatings like seeds in the morning glory family, runner beans like purple hyacinth beans vine or canna seeds. 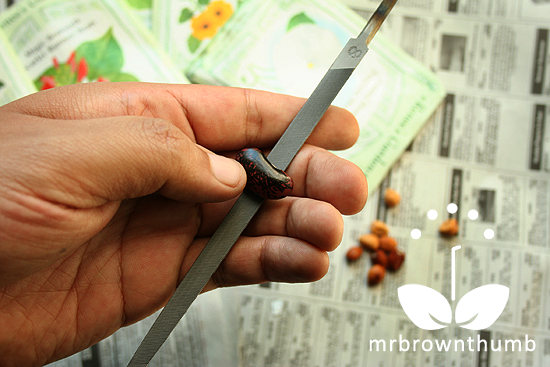 The process of seed scarification can be accomplished by rubbing the seed on file or sandpaper. Be careful not to go too deep into the seed itself. Scratch the seeds just enough that you can see a difference is color of the seeds should be enough. Water is easily soaked up through the seed coat after you've done this. Seed stratification is sometimes better known as cold stratification and the easiest way to accomplish this is by planting the seeds directly into the ground and letting nature do the work, like in the case of these purple coneflower seeds I direct sowed in the garden. Although, sometimes you'll come across seeds packets with instruction indicating the seeds should be stratified indoors in a refrigerator. 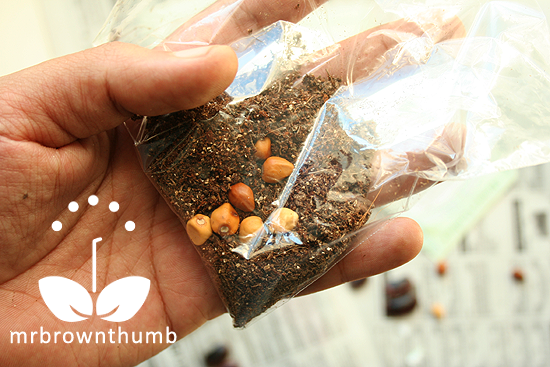 To accomplish seed stratification indoors I'll place a small amount of perlite, vermiculite, coco coir or sand in a plastic sandwich bag. I'll moisten the medium making sure it doesn't get too wet, place the seeds inside and then place the sandwich bag in the fridge, not the freezer. Over the course of two weeks I'll periodically check to make sure the medium hasn't dried out. At the end of the two weeks I'll take out the bag and place it in a cool location for a week. Then the bag with the seeds goes back into the fridge for another two weeks. At the end of these two weeks the bag of seeds comes out into a cool location for another week before the seeds are sown. I'll complete this cycle for about two months. It is important to note that you shouldn't let the medium you use dry out during this process. What we're doing when we stratify seeds indoors in a refrigerator is mimicking the freeze-thaw cycle that occurs in nature. Seeds that need this are usually perennials, tiny seeds and seeds for trees and shrubs. Soaking seeds to get them to germinate is the easiest of all the methods, there really isn't much that needs to be explained. You place seeds in lukewarm water for 24 hours prior to sowing. Large, hard and wrinkly seeds, like those of nasturtiums, are the seeds that you'll benefit from being soaked overnight. I've also used seed soaking in place of seed scarification in the case of canna seeds. If you've ever had to scarify a bunch of canna seeds you know how annoying the process is. To make things easier with canna seeds I've brought water to a boil, removed it from the flame, and just plopped a handful of seeds into the boiling water. You'll hear the seeds "pop" and crack, and see them expand almost instantly before your very eyes. Let the water cool enough for you to handle and remove the seeds. Seed scarification and seed stratification aren't difficult terms to remember and observing the seeds you're planting will often give you a clue as to which treatment the seed needs. Remember: seeds that are large or have hard coatings are usually the ones that need to be scarred to allow them to absorb moisture. Seeds that need to be stratified are usually perennials, tiny seeds like those of poppies or seeds for trees and shrubs. 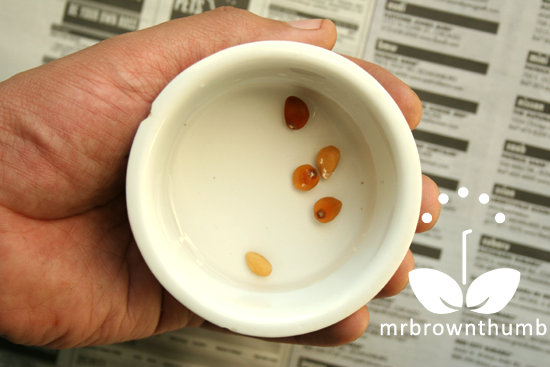 Seeds that need to be soaked before planting are usually seeds that are wrinkly, or seeds that you have scarified. If you need more information on seed starting or seed saving you should use my search engine for seed starting information. I only include the best sources for info on seeds in that Google custom search engine. Thank you for the very helpful post. I'm starting to get the hang of these methods. You laid it all out very nicely. As for blogger. They restored some of my drafts today (although I'd given up waiting and reposted them already). Maybe there's hope for your comments. I just wish they'd been upfront with the amount of time it takes. @Gardener on Sherlock, You're welcomed and thank you for the feedback. I don't think they had an idea of how long it would take or just how big the problem was. Fortunately, it doesn't happen all that often. @Ellie, Thanks for the comment. I updated the post to include mention that I do this for about two months to make sure that the seeds are properly stratified. If you soak your nasturtiums, you don't need to scar them right? Thanks for the great post on the three S's. We've used a box cheese grater to scarify seeds and it was easier on the hand when doing a larger number of seeds. I've also used a microplane and it works great! @Meemsnyc, With nasturtiums you can do one or the other. Although, you'll have almost guaranteed success if you do both. If you scarify them and then soak them before planting. @Debbie, You're welcomed. Hmmm, the cheese grater sounds like an awesome idea! Thanks for sharing it. You know MBT as I was planting my natsurtiums yesterday I kept thinking I should be soaking them overnight. Do you think they will bloom or should I dig them out of the pots and soak them? Thanks for this informative post! It's great to have the whole process broken down, in both cases. So much to learn! Thanks for the tips. I'm kinda new to gardenning (and to blogging) and came across those two words for several of the seeds I got recently so it's useful to get clarity on what to do! @Eileen, Looks like my previous comment didn't save. You probably already did this, but you could soak them or just direct sown. Although, if you presoak they do a lot better. @RedGardenClogs, You're welcomed, hope the post was of use to you. @GardenHoard, You're welcomed. Give it a try...so much easier than trying to scarify them by hand. @Ombeline, You're welcomed. If you have any questions just leave them in a post that covers them. Welcome to gardening and garden blogging. Hi. I just brought some seeds and have never heard of this scarification process, this is how i found your blogg. Very interesting. I will definatly try this method, who know's beginners luck! Scarification doesn't get a lot of mentions because for most people soaking seeds with heavy seed coats will work just fine. But if you want to increase your seed germination rate try scarification and soaking. They'll do much better. Yeah, when I think about how cold it is in Chicago in the winter I just think about how lucky I am to be able to garden in a climate where poppies germinate pretty well. Yeah, I cold stratify a lot of seeds outdoors, and all of my perennials are direct sown in the fall so that it happens naturally. This post was just an explanation of how to do it inside since I have written about doing it outside before. You can try to cold stratify them in the fridge somehow, but it usually take a couple of weeks, by that time it may be too warm in your area? Have you tried other kinds like California poppies? No I haven't tried them. The heat last summer no matter how manytimes I watered the sun just baked the seeds. I purchased them from a poppy seed supplier and not one sprout. Maybe more mulch. I have grown them no problem in the northwest.Doing the fridge may work but the cold is that so the seeds will want to grow? I thought poppies liked hot/arm weather. Have you tried other methods of scarification, such as using an acid or a hot water bath? Thanks for the nice article. Hi Bonny, Yeah, I scarify seeds with hot water too. I find it works best for hard seeds like peonies and sometimes cannas too. I love the cracking sound they make as the seed coat breaks open. Do castor bean seeds need to be scarified?